LB1 High Performance New Premium Multipurpose 41-Piece Precision Tools Kit for Mobile, Cellphone, iPhone, Android, ipad, Tablet and more by LB1 High Performance at DJ Luu. MPN: TK-LA43-P0001. Hurry! Limited time offer. Offer valid only while supplies last. 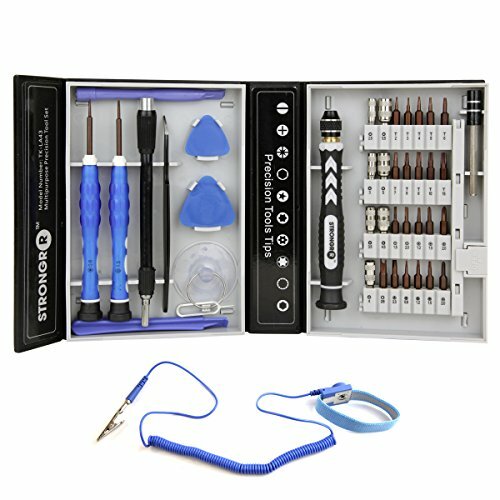 LB1 High Performance Premium Multipurpose 41 Piece Electronics Tool Set for Repairing Apple iPhones, Android Phones, Tablets, Computers, Electronics. LB1 High Performance Premium Multipurpose 41 Piece Electronics Tool Set for Repairing Apple iPhones, Android Phones, Tablets, Computers, Electronics. We asked numerous electronics repair technicians what their perfect tool kit for repairing mobile phones would be, and based off their feedback we created this kit. Use the 4 spudgers [pry tools] and suction cup to safely disassemble housings without damage. Use the flexible extension bar to easily reach screws in hard to reach places, while applying constant pressure utilizing the screwdriver's free spinning end cap. The Anti-Static Wrist Strap prevents damage from static electricity.